There was something special today about my usual mountainside hike through the beautiful Western Red Cedars, Douglas Firs and Giant Leaf Maples. Although the forest understory is coming to life literally before my eyes, there is a non-visual element, almost magical in its veil-like nature, yet half perceptible to the senses. Poplar buds have fallen without abandon, and infused the air with a musk laden fruitiness that I could literally douse myself in had it been bottled. The aroma of fir pitch and cedar leaves is intoxicating after a fresh spring rain. It is simply not enough to just pass through the wood at this time of year. It is worth every invested moment to slow down and commune with what is on offer, and learn about the multidimensional ways in which she heals. Here are just a handful of the healers that I encountered today. Habitat: Skunk cabbage can be found growing along water channels, like ponds, marshes and streams, among the soft and hardwood trees. It is especially found amongst alder and maple, but also the common coniferous trees of the Pacific Northwest. Harvesting: The taproot of skunk cabbage is the medicinal part. Roots are generally harvested in early spring or late fall/winter, when the energy of the plant has descended and the aerial parts are dormant. However, you may want to make sure there is at least the end or the beginning of this years growth, so that you can locate the plant! It is a very wet affair! Properties and Actions: Skunk cabbage is antispasmodic, diuretic, expectorant, stimulant, slightly sedating/narcotic, and calms Liver Wind (TCM). Skunk cabbage regulates Vata and diminishes Kapha (Ayurveda). 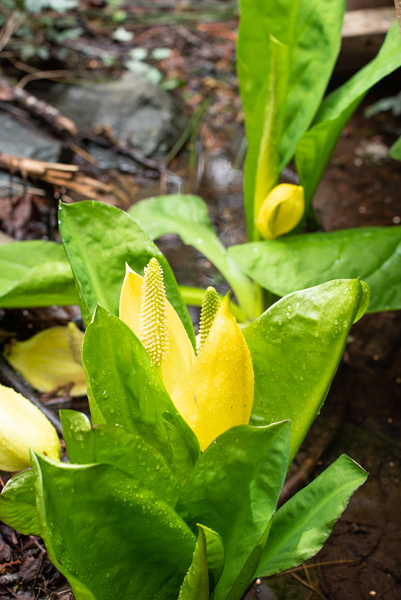 Indications: Skunk cabbage has been used in numerous respiratory conditions such as asthma, TB, whooping cough, and pleurisy, menstrual cramps, hay fever and allergies, as well as nervous conditions such as epilepsy, convulsions, MS, Parkinson’s disease and Turret’s syndrome. Cautions and Contraindications: Contraindicated in pregnancy, lactation. Large doses have caused nausea and vomiting and neurological effects such as headaches, altered perception and dizziness. 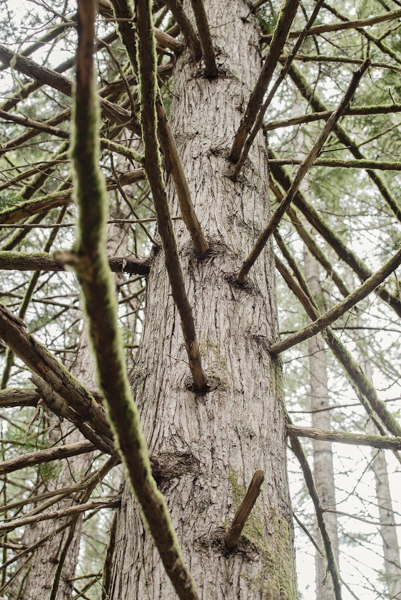 Habitat: Douglas Fir is one of the most common conifers on the Pacific Northwest coast. Another common fir here is the Grand Fir (Abies grandes). Douglas Fir are versatile growers, and prefer a relatively sunny and dry location. They are abundant in my area of Southern Vancouver Island. Harvesting: Pitch and needles can both easily be harvested and used medicinally. The tender new growth on the tips which emerge from April – June are the sweetest and taste most pleasant in teas or honeys. Pitch can be harvested at any time, taking care to leave the original source over the tree’s wound intact. Properties and Actions: Fir is laxative demulcent, stimulant, astringent, expectorant, diaphoretic, anti-arthritic, vulnerary, antibacterial, diuretic, antiseptic, anti-fungal, transforms Phlegm and stops coughing, and releases Wind-Cold (TCM). It could potentially calm or regulate all 3 doshas in Ayurveda, depending on use. Indications: Fir is effective for skin ailments such as wounds, cuts, boils and bites; respiratory ailments such as congestion, infections, colds, flu, and sore throat; fever, sore muscles, joint pain, and poor circulation. The pitch can be used raw or made into salves and poultices for external application. The needles, especially new growth/tips, may be infused into teas/decoctions, and have a high level of vitamin C. Their bitterness stimulates the liver and digestive enzymes. They pair wonderfully in tea with other herbs like rose or chai spices. Fir tip infused honey is one of my favourites, and a great remedy to have around for cold and flu season. Cautions and Contraindications: Fir astringency can cause nausea and vomiting in large doses. Not for use in pregnancy or nursing. 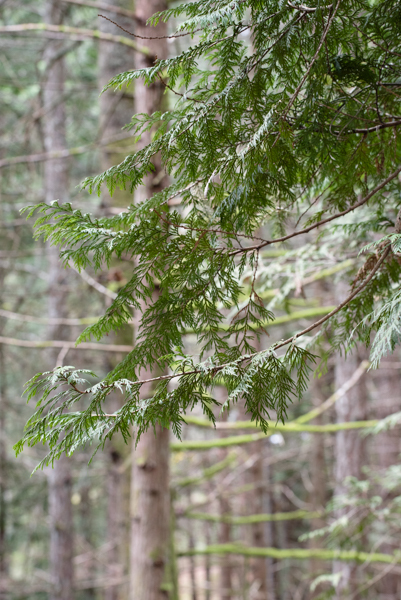 Habitat: Western Red Cedar is the native species of cedar on Vancouver Island. There are several other species of cedar native to North America, China and Japan. Western Red Cedar grows in the deep shady moist areas of the Pacific Northwest rainforest, alongside other coniferous and deciduous trees such as Douglas Fir, Grand Fir, Big Leaf Maple, and Western Hemlock. Cedars can live to be over 1000 years old. Harvesting: The new greener growth on the cedar tips (on a green stem) is best for harvesting. These emerge from May-June. Thujone is the main active constituent of cedar, and has attracted some controversy due to its potential toxicity to organs, especially the liver. The new green tips contain the least amount of thujone. Properties and Actions: Cedar is emmenagogue, antiseptic, astringent, antimicrobial, hemostatic, expectorant, antipyretic, cools Blood (TCM), and stabilizes and binds (TCM). It can be used in instances of increased Pitta and Kapha. Indications: Thuja is used for skin conditions such as fungal infections burns, psoriasis and warts, coughs, colds, flu, bleeding, dysentery, delayed menstruation, bladder infection, frequent urination, and rheumatism. Thuja stops bleeding in Cold or Hot Blood Stasis (TCM). It can be used as an expectorant and antimicrobial treatment by decocting for drinking, and the steam can be inhaled. The decoction may also be used externally as a wash for skin conditions. Thuja tinctures well, and a higher percentage of alcohol extracts more thujone. The tincture should be used in small doses. Infused oils and liniments/salves relieve pain in cases of Blood Stagnation, and can be used topically to treat skin conditions. To preserve the volatile oils and hence the thujone content which is antibacterial and antiviral, some herbalists prepare cedar as a cold infusion as an alternative to tincturing. In TCM, thuja is mainly used as a hemostatic, and prepared more commonly as a hot decoction, sometimes even charred which increases the hemostatic properties. My friend Jim, a local medicine man for a local First Nations band, says that mental emotional disorders are treated by giving away the energy to cedar. One wraps one’s body in a cedar bough, and releases the thoughts and negative energy by speaking them to the cedar, finally releasing the bough in sharp dismissal of the troubles. Cautions and Contraindications: Not for use in pregnancy, nursing, seizures, and with seizure medications. Thuja is not for long term use, as thujone may over time have a neurodegenerative effect (the same effect as Absinthe). Habitat: In the PNW coniferous understory. T. ovatum is our most common local trillium. Other species are found throughout North America. 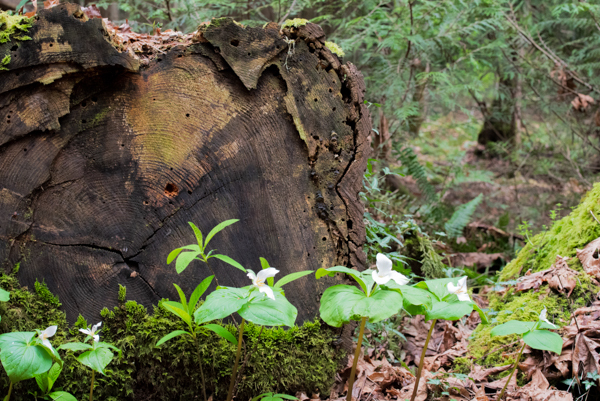 Harvesting: Trillium is very fragile and endangered in many areas. 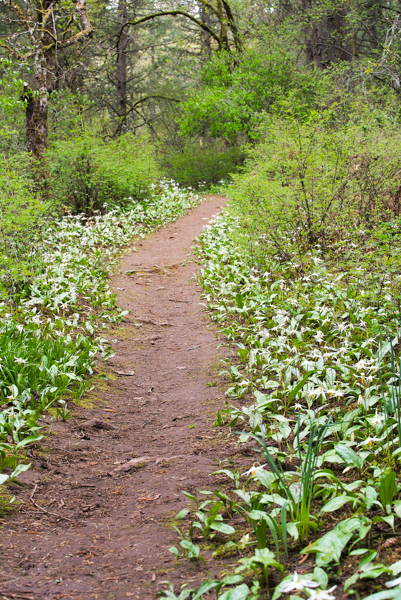 It takes up to 10 years for a trillium plant to emerge and flower from underground. Picking the aerial portions can kill the plant, as obviously can harvesting the root. Trillium is on United Plant Saver’s “at risk” list. Don’t harvest in the wild – use only cultivated species. Properties and Actions: Trillium is hemostatic (TCM), expectorant, emmenagogue, invigorates Blood (TCM), astringent, antispasmodic, alterative, and antiseptic. Trillium may exert a regulatory effect on Vata and Pitta, and diminish Kapha. Indications: Trillium is effective for menorrhagia, dysmenorrhea and other menstrual irregularities, leukorrhea, bronchial secretions, bleeding, and facilitation of childbirth. Internally, trillium is best known for regulating menses, as a uterine tonic, and as a hemostatic for abnormal hemorrhages of various types. Externally, trillium can assist healing of sores, ulcers and various skin ailments. Cautions and Contraindications: Not for use in pregnancy. 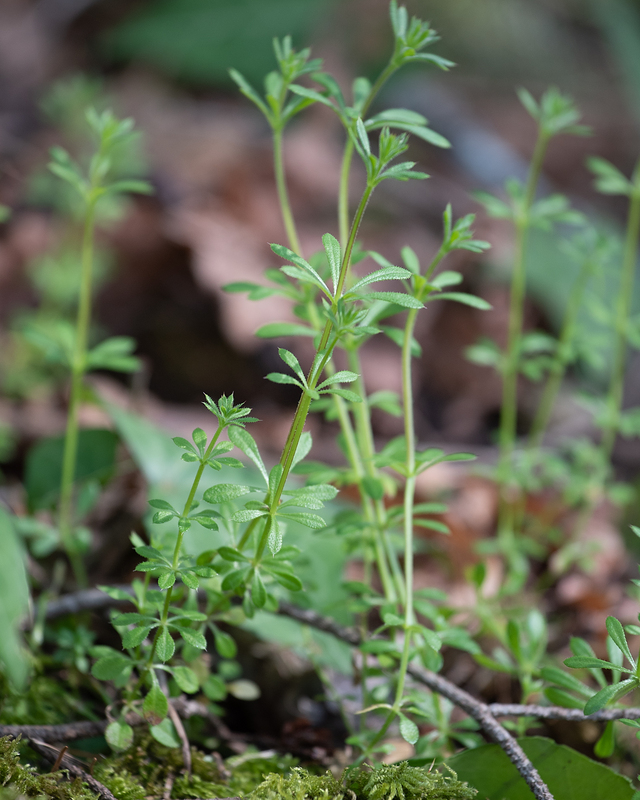 Habitat: Cleavers are found in the shade of the forest where there is moist soil, often alongside nettles. Cleavers self-seeds each year, so leave some to go to seed if you want to keep harvesting from that area. Harvesting: Harvest cleavers throughout spring (April-May), before the tiny flowers emerge and when at least 5 inches tall. Use fresh when possible. Properties and Actions: Cleavers is very diuretic, alterative, refrigerant, astringent, vulnerary, tonic, drains Dampness (TCM), clears Heat toxins (TCM), and clears Damp-Heat (TCM). Cleavers decreases excess Kapha especially, and Pitta. Indications: Cleavers are used in lymphatic tissue swellings and accumulations, edema, urinary disorders such as UTI, stones and BPH, toxic swellings such as cysts, skin disorders such as eczema and psoriasis, cancerous tumours and swollen glands, tonsillitis, ulcers, bloody and mucous discharges. Cautions and Contraindications: Not for use in diabetic or pre-diabetic conditions. Habitat: Usnea Longissima is one of the common species of Usnea found in the PNW. There are over 600 species of these lichens in the world according to Stephen Buhner. 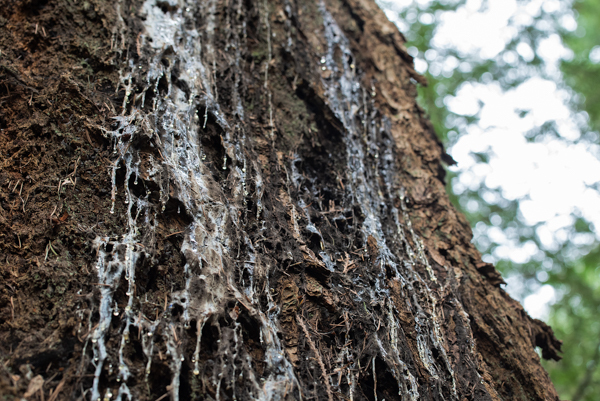 It grows in undisturbed forests, free of pollution, and is found on trees such as Douglas Fir and Arbutus in our South Vancouver Island forests. It also grows on my Gingko tree at home! Harvesting: In some areas usnea is endangered. It is abundant in our local forests, but care must be taken not to disturb its slow growth. It is susceptible to pollution, toxins and habitat changes. Usnea should be harvested from fallen branches, best soon after a wind storm. Usnea is identifiable by its inner white elastic core that stretches when pulled at gently. Properties and Actions: Usnea is highly antimicrobial (antibacterial, anti-fungal, and antiviral), alterative, vulnerary, clears Heat toxins (TCM), anti-parasitic, releases Exterior Wind-Heat (TCM), and drains Dampness (TCM). It diminishes excessive Pitta. Indications: Usnea is very effective against Gram positive bacterial infections, even those that are resistant. It treats strep throat, bronchitis, pneumonia, wound infections, trichomonas, cold, flu, UTIs, herpes simplex, GI infections, Epstein Barr virus, candida, ringworm, impetigo, and diarrhea. Stephen Buhner classifies it as a non-systemic herbal antibiotic, better used for isolated infections, especially of the skin, GI tract and lungs. Usnea has also found to be active against some cancers such as lung, breast and vulvar. It is recommended to both heat and tincture the herb to extract the immune-potentiating polysaccharides that are water soluble and the other compounds such as usneic acid which are alcohol soluble. Heat the herb in the water component of the tincture first, then add the alcohol prior to maceration. Usnea can also be powdered and applied directly to wounds, or infused into oils and salves. It can be prepared as tea after wetting the herb with alcohol first and extracting 30-60 minutes. Cautions and Contraindications: Not for use in pregnancy. Large doses of usneic acid can be toxic to the liver. Habitat: There are about 70ish species of Mahonia world wide. Mahonia nervosa is the most common growing in our Southern Vancouver Island forests among the understory of coniferous trees. They like shady slopes with rich yet well drained soil, and form larges patches via underground rhizomes. Harvesting: The highly medicinal root can be harvested from fall until spring. The inner cambium is where the active constituent berberine is. Peel away the outer bark, and you will see the bright yellowish orange colouration of the berberine. Chop the root finely prior to drying as they become very hard after drying. The berries and leaves can be collected whenever available. 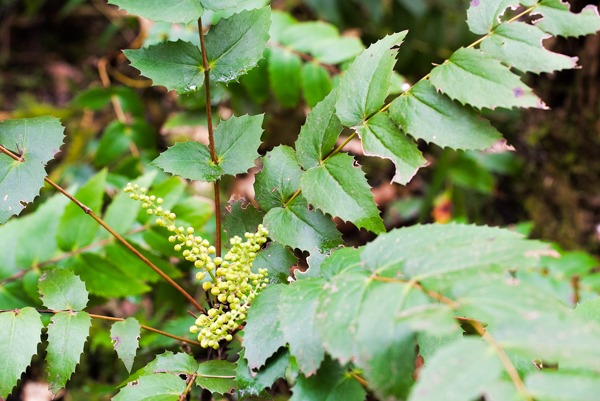 Properties and Actions: Mahonia is hepatic, laxative, alterative, cholagogue,, antiseptic, vulnerary, antimicrobial, antidepressant, neuroprotective, and hypoglycemic. 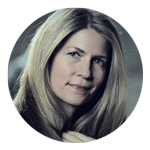 It clears Damp-Heat (TCM), and clears Heat toxins (TCM), as well as diminishes excess Pitta. It could aggravate Vata due to its bitter, cooling and drying nature. Indications: Mahonia has been used in hepatitis, gallstones, sluggish liver with congestion, cholecystitis, jaundice, cancer, arthritis, bacterial infections parasites, PMS, psoriasis, eczema, acne, skin infections/wounds, dermatitis, diarrhea, dysentery, bladder infections, diabetes, Alzheimer’s , fever, constipation, leukorrhea, opiate addiction, alcohol hangover, diabetes, depression (enhances serotonin), and as an adjunctive to radiation therapy. The berberine plants are again classified by Stephen Buhner as non-systemic antibiotics. Mahonia’s most notable uses are for stagnant conditions of the liver and associated symptoms, GI infections, and skin complaints. It can be used as a decoction, tincture, oil or salve. Oregon Grape Root is much more plentiful than some of the other berberines like Goldenseal, and should be considered as a substitute where appropriate. However, it is on United Plant Saver’s watched plants list. Cautions and Contraindications: Not for use in pregnancy, or Coldness, Yin or Blood Deficiency with Heat signs, Spleen and Stomach Deficiency (TCM). 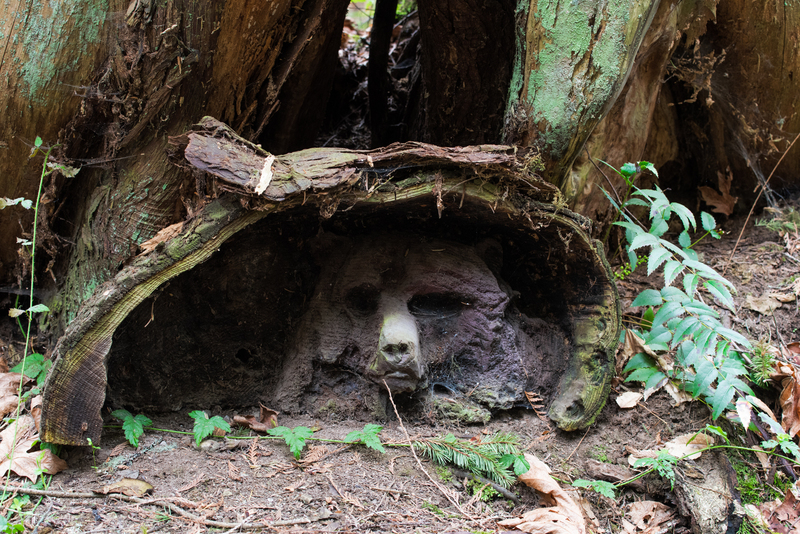 Habitat: Found all over our forest understories. Harvesting: The sporangia on the back of the fronds contain the medicine. When the spores are reddish brown (late summer), harvest fronds and place in a paper bag to dry, making sure to retain all of the dry powdery spores. Properties and Actions: Sword Ferns are primarily anti-inflammatory and analgesic, decreasing Pitta. Indications: Sword Ferns are used for sore and stiff muscles and joints, back and shoulder pain, arthritis, and menstrual cramps. Sporangia can be extracted in liniments or infused in oils and applied externally. They can also be added to a warm bath either directly or via decoction. Jim the medicine man states that the fronds can be laid on directly to ease back and shoulder pain. Infusions and poultices are used to treat wounds an sores. Documented uses for Sword Fern are external, and there is little information regarding internal uses. 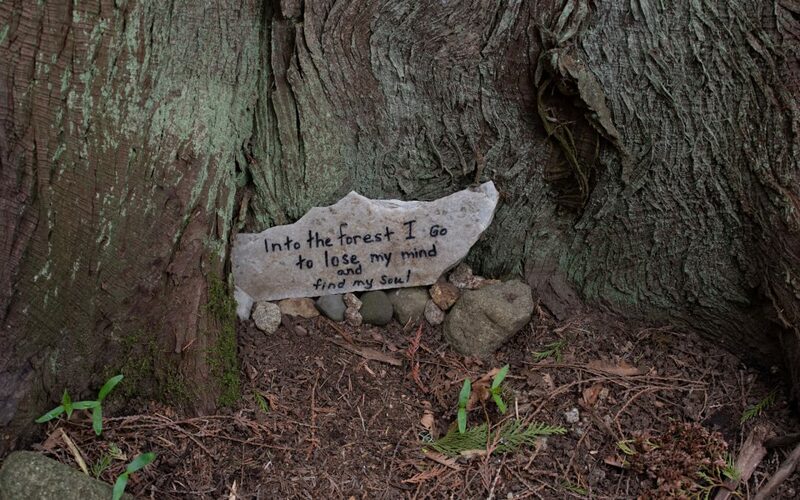 Our Pacific Northwest rainforests are a virtual medicine chest. 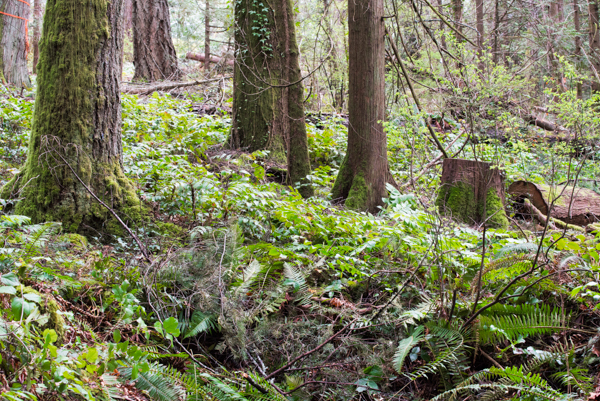 What’s growing in the forests near you? Taking a local herbal medicine course or walk or a wildcrafting workshop are good places to start learning. Field guides are always helpful for identifying plants. As a final word of caution, never consume a plant that you can’t positively identify. Happy medicine hunting!